Treatments start from £149. Administered by fully qualified medical and dental professionals. If you are interested in a consultation please fill out the form below, email info@revolutionaesthetics.co.uk or call 07826 193 638. Wrinkles, lines, and furrows are a natural result of the expressions we make. Treatment for wrinkles can be given in the form of anti-wrinkle injections. At REVOLUTIONAESTHETICS we are highly experienced medical and dental professionals currently using the leading brands in anti-wrinkle treatments. 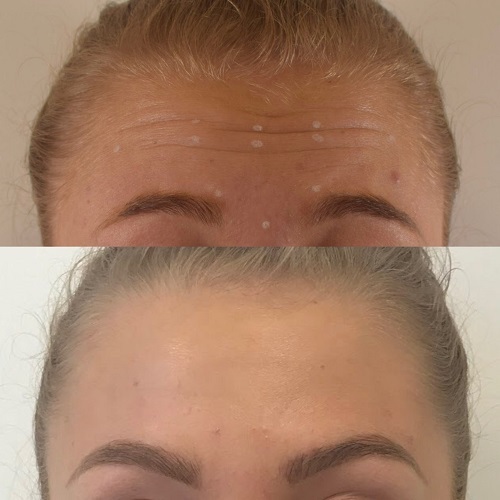 The injections work by blocking nerve impulses to tiny facial muscles - thus reducing the prominence of expression lines, and achieving a more youthful radiant look to revitalise your face. All treatments are carried out by fully qualified professionals with backgrounds in medicine and dentistry. At REVOLUTIONAESTHETICS we believe safety is paramount. Roughly around 30 minutes, but every person is different and this will be discussed in your personalised consultation. Q. How long does it last for? Around 4-6 months. This range is because some individuals will break down the active ingredient quicker than others. Following consultation whereby your specific needs will be identified, the treatment will be administered using ultra fine needle injections to the specific areas of the face. It is a common misconception that effects will be visible straight away but it can take up to five days before you begin to see results. All clients are reviewed after two weeks of receiving treatment to ensure satisfaction. There are very few side effects associated with this treatment. This is discussed during your consultation. Soreness and mild swelling can occasionally occur, which commonly settles quickly. All clients are provided with aftercare following treatment. This is dependent on the number of areas treated and volume of product required. Prices start from £149. At REVOLUTIONAESTHETICS, nothing is more important to us than our clients' safety. Anti-wrinkle injections are safe as long as they are administered properly by qualified individuals. Because the body breaks down Botox within months, the adverse side effects experienced by a tiny percentage of patients are not permanent. The NHS website has information about cosmetic procedures. Q. Is the treatment suitable for men? Anti-wrinkle injections are a fantastic anti-aging solution for both women and men. Botox for men - sometimes called 'brotox' - is becoming ever more popular as a way of subtly reducing the appearance of wrinkles and frown lines.